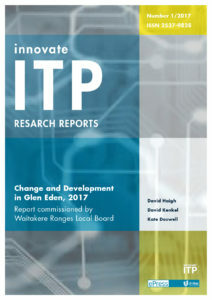 This report is stage one of a report on change and development issues in Glen Eden. The Waitakere Ranges Local Board commissioned staff of the Social Practice Department of Unitec to carry out a two-stage report. This first stage is a literature search looking at material specific to Glen Eden as well as more theoretical information about development and growth. The second stage will be completed by December 2017 and reports on interviews carried out with key stakeholders in Glen Eden. This report makes a number of suggestions to the Waitakere Ranges Local Board relating to redevelopment of the Glen Eden town centre, and to design and urban policies concerning future intensification of Glen Eden with emphasis on strategies to deal with such matters as safety, cycleways and pedestrian amenity.